In Summer 2015 a Capokolam team collaborated with local partners, & children from CACM to deliver a month & half long program to marginalized children around Sri Lanka. This was a debut for Capoeira, &the first time a program of this kind had come to these shores. Over 3 weeks Capokolam delivered a full time program of Capoeira, English, Art, Dance, and Sports to 40 children living in care. We worked closely with local staff and international volunteers. This culminated with a number of atmospheric performances and an exhibition of their work. Capokolam took the project into the Highlands of Sri Lanka, for a mutually enlightening workshop with 80 ecstatic children, in the endemically impoverished Indian Tamil communities beyond the clouds. Performing at the Faculty of Fine Arts, Eastern University, Capokolam's children articulated an interpretive dance on the history of Capoeira and slavery & displayed their Capoeira prowess in the roda. Afterwards they took part in a discussion on it's cultural & social similarities to the history & practice of performing arts in South Asia. 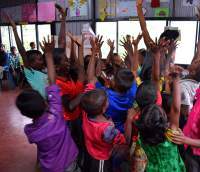 In Mullaitivu, the last front of the civil war and the scene of intense suffering, Capokolam delivered a workshop to 60 children. In this sobering place of war and occupation, the workshop provided a much appreciated escape. Deep in the jungles of The Vanni, our workshop with 40 marginalized children from rural communities met with rampant enthusiasm. Capokolam travelled to the islands beyond Jaffna, a pivotal site in the long and violent civil war, to deliver an enthralling workshop for 60 enthused children.